How do you honor a man who converts a nation to Christ? 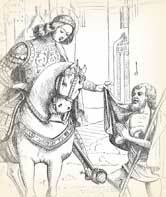 In France, St. Martin of Tours is venerated on this day, November 11, with a feast. Even if one scrapes off the crust of legend, it is clear he was an extraordinary man. Martin was born around 316, the son of a military tribune. Even as a youngster, he cared more for spiritual concerns than for military life. Although compelled to take up arms he "kept completely free from those vices in which that class of men become too frequently involved," wrote his associate Sulpitius Severus. "He showed exceeding kindness towards his fellow-soldiers, and held them in wonderful affection; while his patience and humility surpassed what seemed possible to human nature." He aided "those who were in trouble, by furnishing assistance to the wretched, by supporting the needy, by clothing the naked, while he reserved nothing for himself from his military pay except what was necessary for his daily sustenance." 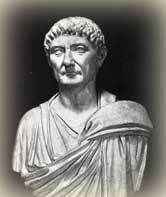 The most famous instance of Martin's charity was reported by Sulpitius. "[I]n the middle of winter, a winter which had shown itself more severe than ordinary so that the extreme cold was proving fatal to many, he happened to meet at the gate of the city of Amiens a poor man destitute of clothing. He was entreating those that passed by to have compassion upon him, but all passed the wretched man without notice, when Martin, that man full of God, recognized that a being to whom others showed no pity, was, in that respect, left to him. Yet, what should he do? He had nothing except the cloak in which he was clad, for he had already parted with the rest of his garments for similar purposes. Taking, therefore, his sword with which he was girt, he divided his cloak into two equal parts, and gave one part to the poor man, while he again clothed himself with the remainder." 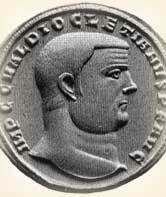 Martin enraged Emperor Julian by saying, "Hitherto I have served you as a soldier: allow me now to become a soldier to God..." The Emperor accused him of cowardice, to which Martin replied he would stand unarmed in front of the coming battle. That night, however, the enemy sued for peace. Having gained release from the army, Martin studied and was baptized under Bishop Hilary and lived the life of a hermit, emerging from solitude only to preach. He suffered persecution from Arian heretics while seeking to convert his own family to Christ. Around 371, the people of Tours, impressed by his holy life and miracles, made him Bishop by force. Taking his duties seriously, Martin preached, destroyed pagan temples, assisted all who were in need, and worked miracles. To gain the solitude he craved, he built the first abbey in France, at Marmontiers between the river Loire and a rock face. Clugnet, Lüon. 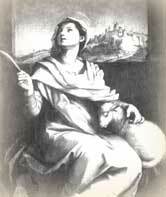 "St. Martin of Tours." The Catholic Encyclopedia. New York: Robert Appleton, 1914. Daniel-Rops, Henri. The Heroes of God. Garden City, New York: Doubleday, 1965, 1958. Jameson. Sacred and Legendary Art vol 2. London: Longmans, 1870. "Martin, St." The Oxford Dictionary of the Christian Church. Edited by F. L. Cross and E. A. Livingstone. Oxford, 1997.